Jones Interiors are proud to be a national distributor for Silent Gliss, a leading global supplier of motorised and manual curtain and blind systems to the high end market. All Silent Gliss products are made to measure and created by a team of fully trained experts here at Jones, who also offer comprehensive customer support and technical advice. We are able to find a perfect solution regardless of the size, shape or complexity of a window. 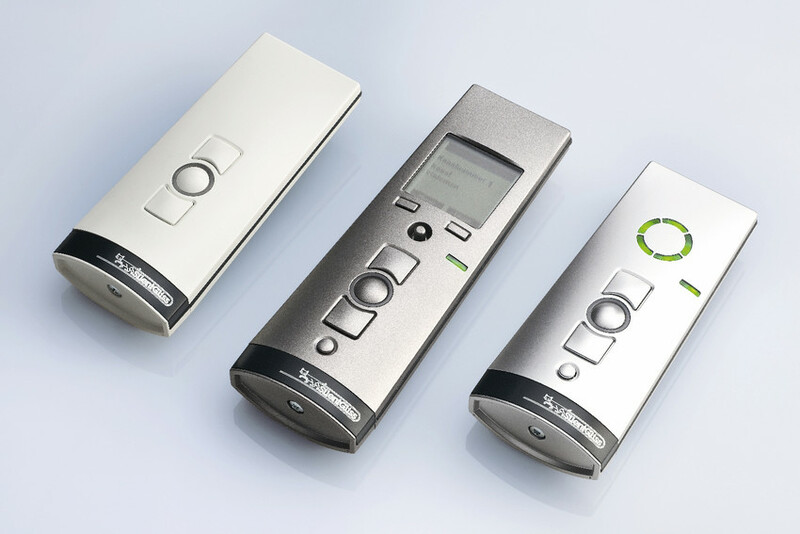 Silent Gliss is proud to offer a range of wall switches and stylish handsets with a wide choice of operating options to control our motor operated blinds and curtains. The Radio Remote Control gives you control of your Silent Gliss system from the comfort of your chair and is compatible with most motorised options. The current demand for large glazed areas and wintergardens continues as architects and clients see the value of having bright, open living spaces that interface with the outside world while allowing dramatic design for modern living. The advantages are obvious though the disadvantages can seem difficult to manage in terms of heat (solar gain), light, lack of privacy and glare. Silent Gliss systems make it easy to attenuate these. Striking building design can present inaccessible or awkward shapes. Silent Gliss can deal with almost all possibilities with various solutions for domestic or commercial settings. The most popular use for pleated blinds is within conservatories where they offer unparalleled versatility in accommodating the many glass shapes and angles required. Silent Gliss offer sloping, horizontal and vertically hanging options. The easily operated light weight construction enables pleated blinds to be fixed close to the glazing within the bars for maximum heat control. When opened the minimum stacking area allows maximum visibility. We offer a range of highly energy efficient fabrics to complement your interior design and to enhance the benefits of your windows or conservatory. With Venetian Blinds you have the ultimate control over light and glare – minute adjustments as the day goes on enable you to have maximum light and visibility without discomfort. Choose from aluminium or wood slats – a wide range of colours is available in both. Perfect for floor to ceiling applications or smaller installations, inside or outside recess. A very contemporary look – especially with narrower 89mm louvres. A system is available for bent as well as sloping windows. The comprehensive dim-out range incorporates over 20 years of specialist knowledge in the field. Dim-out blinds are used for both commercial and domestic situations where room darkening is a requirement – conference rooms, audio visual, medical (X-rays etc.) and bedrooms. The range comprises of vertical, horizontal and sloping models and offers a choice of headrails and side channels which allow the blind to fit discreetly in proportion to the window’s dimensions. Their clean lines complement modern architecture and interior design perfectly. They allow maximum shading with minimum window obtrusion. Attenuate light from translucent to blackout with your fabric choice. Best known for their use in multi-bed hospital wards these systems have numerous other applications including as shower rails, in surgery and other health separation areas and as industrial separation and overhead tracking. Also perfect for use within health centres and spas or as changing rooms and room dividers. They can be curved or formatted to virtually any requirement. Silent Gliss offer fitting to the wall or ceiling or a combination of both. Stability is designed in, made-to-measure and we even offer a hygienic option with BioCote anti microbial coating. A unique dimension to window treatments – perfect for the popular extensive glazed areas of modern architecture. Choose between flat and folding panels, straight or curved tracks (Panel Glide, Panel Fold, Panel Flex). Panels are easy to remove for cleaning. The Panel Flex System 2730 is the first of its kind! Roman Blinds combine the simplicity of blinds with the warmth and versatility of soft furnishing fabrics. A perfect stand-alone blind or together with curtains in the same or contrasting fabric. The Silent Gliss hardware systems combine with simple make up components to offer the choice of Roman, Austrian or Festoon effects. There is also a special system – Metropole Roman – enabling you to hang a Roman Blind from a decorative curtain pole. Metropole combines the decoration of curtain poles with the functionality of Silent Gliss curtain tracks. Click here to download the Metropole June 2017 Brochure. Electrically operated curtain tracks are ideal for very high curtains or curtains that are out of reach and essential for audio-visual and conference rooms. In homes they offer the ultimate in luxury, operation can be via switch, remote control or light sensor. Silent Gliss has more than 40 years experience with electrical curtain tracks. We offer solutions for single tracks and multiple tracks and integration into building management systems. For more information on Silent Gliss 5100 Autoglide click here. With cord operation all curtains – even heavy, awkward or difficult to reach – can be comfortably and easily handled. Cord operation prevents soiling of curtains by frequent handling. Suitable for domestic and contract applications. The robust systems are maintenance free. Meant to be bent by design – for bay windows and other curved applications, Silent Gliss corded tracks are unbeatable – they really work! Curtains allow you to express the style of your choice – either contemporary or traditional. Hand drawn curtain tracks are more economical than other options and offer ease of use and with no cords, are ideal for homes or locations with young children.